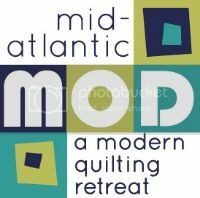 Philadelphia Modern Quilt Guild: Retreat! The Philly Modern Quilt Guild has set up its first retreat! The retreat will be held at The White Oak B&B in Strausberg from Friday, September 30th to Sunday, October 2nd, 2011. The B&B's official address is 958 Eisenberger Road, Strasburg, PA and they seem very experienced at hosting quilting retreats! The cost is $196 per person which includes all meals except Saturday's dinner. The only things you need to pack are your sewing machine and any other small supplies you can't live without - cutting boards, irons, and ironing boards will all be provided! The deposit is $25 per person - please make the check payable to the Philly Modern Quilt Guild to reserve your spot. There are only 13 spots available but there is a minimum of 9 and so far only 8 have paid. If you have any other questions, please feel free to comment here or email Candi Weinrick at candidam@comcast.net. Also, don't forget, only paid guild members can participate! Oh, I cannot recommend this highly enough and if I wasn't already scheduled for an October retreat there myself, I'd indulge and go with MQG! I've gone 3 times with my own group - that has been going for many years - and it's a delightful weekend of sew-til-you-drop, of course close enough to shopping to do some real damage on a Saturday afternoon trip . . .
Three of us were at the last MQG meeting (2 of us joined that night!) and I'll speak for all of us - you will love it.